Joe completed a Foundation Diploma in Art and Design at East Surrey College in June 2011. 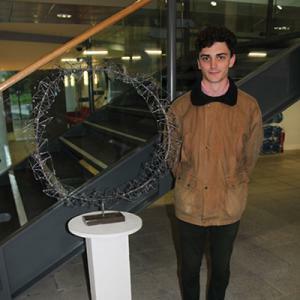 Joe’s final project was selected to be manufactured and installed as the focal point at the front of the College. The 6 metre high raw steel sculpture was sponsored by Wates Construction and transforms the entrance to the College changing forms as you drive or walk along the approach. Joe was extremely pleased with the scaled-up result of his model, and felt the sculpture was a great testimony to his time here. Joe has just completed his second year studying a Degree in Architecture at University of Brighton.